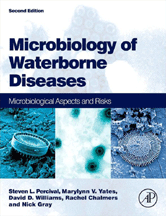 The second edition of Microbiology of Waterborne Diseases describes the diseases associated with water, their causative agents and the ways in which they gain access to water systems. The book is divided into sections covering bacteria, protozoa, and viruses. Other sections detail methods for detecting and identifying waterborne microorganisms, and the ways in which they are removed from water, including chlorine, ozone, and ultraviolet disinfection.